On October 14, 1886, Frank Porter Graham was born in Fayetteville. Graham became a history instructor at UNC in 1914, but left to serve in the Marines during World War I. He was elevated to the rank of first lieutenant before returning to Chapel Hill as an assistant professor. He secured a full professorship in 1927 and three years later became president of the university. When the University of North Carolina, North Carolina State College and the North Carolina College for Women merged in 1932, Graham became the first president of the Consolidated University of North Carolina. 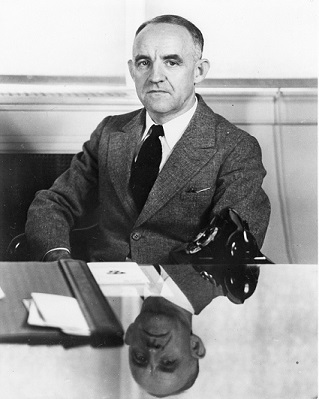 In 1949, Graham resigned from the UNC system to accept an appointment to fill the vacant U.S. Senate seat caused by J. Melville Broughton’s death. Graham’s 1950 Democratic senate primary race against Willis Smith has become legendary for the mudslinging and posturing. He lost the primary but maintained a commitment to public service. Graham became the United Nations mediator and representative to India and Pakistan in 1951, and served as an assistant secretary general of the United Nations before retiring in 1967. He returned to Chapel Hill where he died in 1972. The 1968 student union building at Chapel Hill bears Graham’s name.